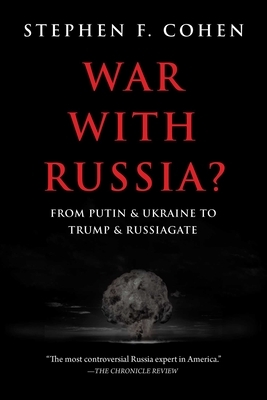 War with Russia: From Putin & Ukraine to Trump & Russiagate (Paperback) | Beach Books Inc.
Stephen F. Cohen is Professor Emeritus of Politics at Princeton University, where for many years he was also director of the Russian Studies Program, and Professor Emeritus of Russian Studies and History at New York University. He grew up in Owensboro, Kentucky, received his undergraduate and master’s degrees at Indiana University, and his Ph.D. at Columbia University. Cohen’s other books include Bukharin and the Bolshevik Revolution: A Political Biography; Rethinking the Soviet Experience: Politics and History Since 1917; Sovieticus: American Perceptions and Soviet Realities; (with Katrina vanden Heuvel) Voices of Glasnost: Interviews With Gorbachev’s Reformers; Failed Crusade: America and the Tragedy of Post-Communist Russia; Soviet Fates and Lost Alternatives: From Stalinism to the New Cold War; and The Victims Return: Survivors of the Gulag After Stalin. For his scholarly work, Cohen has received several honors, including two Guggenheim fellowships and a National Book Award nomination. Over the years, he has also been a frequent contributor to newspapers, magazines, television, and radio. His “Sovieticus” column for The Nation won a 1985 Newspaper Guild Page One Award and for another Nation article a 1989 Olive Branch Award. For many years, Cohen was a consultant and on-air commentator on Russian affairs for CBS News. With the producer Rosemary Reed, he was also project adviser and correspondent for three PBS documentary films about Russia: Conversations With Gorbachev; Russia Betrayed? ; and Widow of the Revolution. Cohen has visited and lived in Soviet and Post-Soviet Russia regularly for more than forty years.